Modern duplex with balcony , very bright in the heart of Palermo Hollywood, a few blocks from the best restaurants, bars and discos in the area. Two twins that can be joined and assembled in a Queen bed - Sofa bed with 2 single beds. - Toilet - Bathroom with bathtube and shower. Dining table with 4 chairs. - 2 Air conditioning / heating, LCD TV 32 cable. Internet WI-FI-Phone-Hairdryer-Iron-Stereo. Laundry in the building. Pool in the terracce (VERY SMALL POOL)just for refreshing. Located 2 blocks from the TV studio "America", 2 blocks from the Clinic "Los Arcos" and 8 blocks from the Clinic "The Trinity" and the Jumbo Shopping Centre Easy. 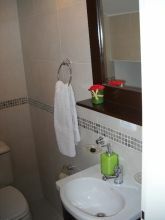 The area has many means of transportation to different parts of the city (train, bus, taxis) and 7 blocks from subway Line D.
Services included in the rent: 1) Services of electricity, gas, telephone (local calls), internet, expenses, council tax, cable TV and water 2) Bed linen and towels 3) Maid service once a week for stays more than 7 days 4) liquid soap and toilet paper in bathrooms 5) A bottle of wine and water gift.